ATTRACTIONS DINING & VALUE GUIDE FUNDRAISER FOR SPARKLE CAT RESCUE! 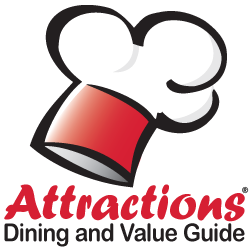 Support Sparkle Cat Rescue and purchase a 2018 Attractions Dining & Value Guide! ​If you purchase a book at one of our events for $25.00, Attractions donates $10.00 back to Sparkle Cat Rescue! ​Can't make it to one of our events and want a coupon guide mailed to you? Order online by clicking the button below. EZPay Products that Sparkle Cat Rescue can fulfill directly (with pickup locally in Burlington, NC) should be purchased through EZPay. This lets us earn the maximum amount toward our fundraiser. Orders will be delivered by one of our volunteers at our designated meeting spot Pet Supermarket near Harris Teeter off S. Church Street) OR Town N Country Animal Hospital in Burlington, NC.